Snakes found breeding in western Nfld. Snakes are not native to Newfoundland, but a provincial wildlife official confirms that the reptiles have been found breeding on the island. This snake was captured in western Newfoundland this fall and brought to the Salmonier Nature Park, where it is being held. ((Wildlife Division photo))Snakes are not native to Newfoundland, but a provincial wildlife official confirms that the reptiles have been found breeding on the island. 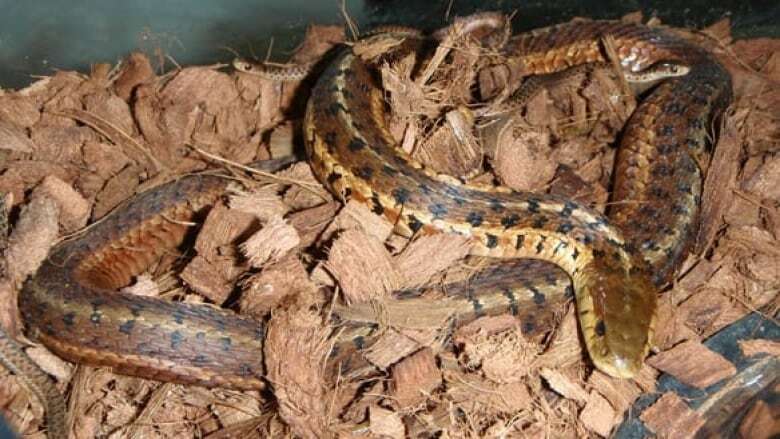 A pregnant garter snake was recently found in St. David's, southwestern Newfoundland, according to Bruce Rodriguez, of the provincial department of environment and conservation in Corner Brook. He said introduced species, such as garter snakes, can cause problems. "One species that snakes are known to eat, that can be important in a snake's diet is the meadow vole," Rodriguez said Thursday. "On the island of Newfoundland, the meadow vole is a unique sub-species to the island and, of course, there's always concerns about introduced animals bringing in disease to the province." Wildlife officials believe snakes may be arriving in the province on farm shipments, such as hay bales. Rodriguez said wildlife officials have been receiving reports of snakes on the island for more than a year. 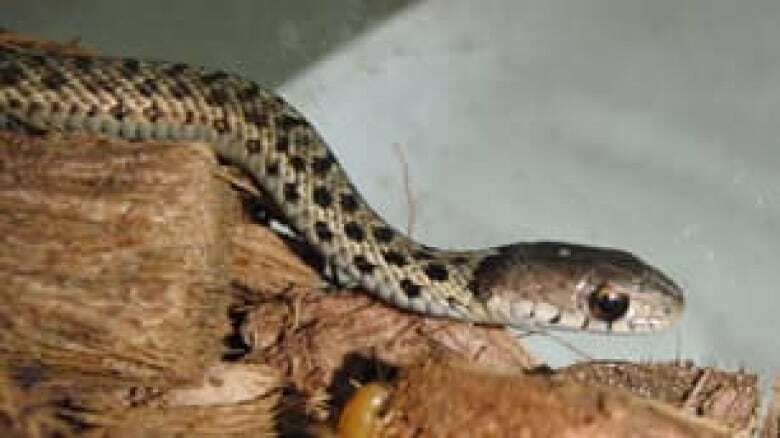 "There was a young snake picked up last year, probably one that was just born, and turned over to a pet store in western Newfoundland," he said. The snake that was brought to the Salmonier Nature Park, in eastern Newfoundland, gave birth to more snakes, including this one. ((Wildlife Division photo))"With the amount of evidence we have, we can say that there is a population [in western Newfoundland] that has survived at least one winter." Rodriguez said it's unclear if the snakes will thrive on the island or make it to eastern communities. "It all depends of food availability. How well they can survive the winter, and how dense their population is at this point. If factors are right, we might get sightings outside of this small little area," he said. A number of introduced species — moose in particular — have thrived in Newfoundland but the island is still free of skunks, porcupines and raccoons.